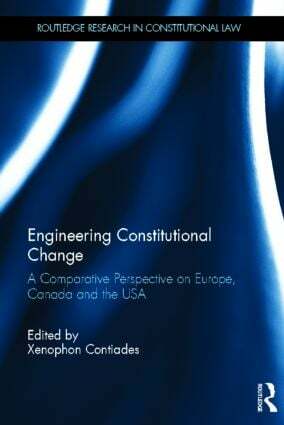 This volume provides a holistic presentation of the reality of constitutional change in 18 countries (the 15 old EU member states, Canada, Switzerland and the USA). The essays offer analysis on formal and informal constitutional amendment bringing forth the overall picture of the parallel paths constitutional change follows, in correlation to what the constitution means and how constitutional law works. To capture the patterns of constitutional change, multi-faceted parameters are explored such as the interrelations between form of government, party system, and constitutional amendment; the interplay between constitutional change and the system of constitutionality review; the role of the people, civil society, and experts in constitutional change; and the influence of international and European law and jurisprudence on constitutional reform and evolution. In the extensive final, comparative chapter, key features of each country’s amendment procedures are epitomized and the mechanisms of constitutional change are explained on the basis of introducing five distinct models of constitutional change. The concept of constitutional rigidity is re-approached and broken down to a set of factual and institutional rigidities. The classification of countries within models, in accordance with the way in which operative amending mechanisms connect, leads to a succinct portrayal of different modes of constitutional change engineering. This book will prove to be an invaluable tool for approaching constitutional revision either for theoretical or for practical purposes and will be of particular interest to students and scholars of constitutional, comparative and public law. Xenophon Contiades is Professor of Public Law and Dean, School of Social and Political Sciences, University of Peloponnese, Director of the Centre for European Constitutional Law (Athens-Greece), and member of the Scientific Council of the Institute for European Constitutional Sciences (Hagen-Germany).